The Eustachian tube connects each middle ear (an air-filled cavity behind your ear drum) with the back of the throat. The normal position of the Eustachian tubes is closed, however they open when we swallow or yawn. If you want to know how they do that, they are attached to the tensor veli palatini muscles in your soft palate which are activated automatically whenever you yawn or swallow. If the Eustachian tube is blocked or does not open properly, air cannot get into or escape from the middle ear resulting in unequal pressure either side of the eardrum. This can cause pain, discomfort, a popping and/or blocked sensation, hearing loss, tinnitus or dizziness. ETD can be caused by a middle ear infection, resulting in the build up of fluid behind the eardrum causing the eardrum to become retracted. Other common causes include: a cold, allergies, sinus infections, altitude changes, or infected adenoids (two small pads of tissue, close to the Eustachian tubes, that are believed to play a role in immune system activity). ETD generally resolves by itself without treatment. However, there are a number of ways to provide relief and these are described below. If symptoms are severe or persistent for more than two weeks then it is recommended to seek the advice of your GP. There are a number of methods that help equalise this pressure in the ears which can be carried out at home. Each or a combination of these techniques may need to be done mulitple times in order to provide relief. NOTE: We advise against practising ear equalisation techniques if you have a current or recent middle ear infection, unless on the advice of your GP or other medical doctor. Valsalva manoeuvre: take a breath inwards, close your mouth, pinch your nose and gently blow outwards through your nose until you feel your ears pop. Toynbee manoeuvre: take a sip of water, pinch your nose and swallow the water with your nose pinched. Lowry manoeuvre: this technique is a combination of the Valsalva and Toynbee methods. It involves pinching the nose, closing the mouth, gently breathing outwards and swallowing at the same time. Jaw wriggling technique: open your mouth and wriggle your jaw from side to side until your ears pop. Another alternative is to use the Otovent, which increases pressure in the nose and opens the eustauchian tube. This allows pressure equalisation and if fluid is present behind the eardrum, it allows this to be cleared. An otovent kit can be bought from a pharmacy or can be obtained by special order without perscription. The kit generally consists of: a plastic device and balloons. It does not matter which nostril is used or if you only feel blocked in one side, this technique can be safely followed. On first use, stretch the balloon. Place the balloon over the flat end of the plastic device. Press the other nostril closed with the other hand. Inhale, close your mouth and inflate the balloon by blowing through the nostril. Congestion relief can also be provided by over-the-counter decongestants such as Sterimar Congestion Relief. This can be used 3-5 times daily. Relief should be felt within 2-3 days, after which the frequency of use can be reduced until relief is maintained. If symptoms persist, seek the advice of your GP. In the case of frequent middle ear infections, a referral may be made to an Ear, Nose and Throat (ENT) surgeon. The surgeon may recommend an operation to make a tiny incision in the eat drum (known as a myringotomy) and insert a ventilation tube (tympanostomy tube or "grommet") into the ear drum. This will allow fluid to drain from the middle ear, and for the air pressure to equalise on either side of the ear drum. Ear ventilation tubes usually fall out on their own after six to nine months. After this surgery, it is important to keep the ears dry, as otherwise if any water gets into the ear canal it can cause a middle ear infection. At the time of writing (July 2018), myringotomy surgery under the NHS is slated to be restricted to only the most severe cases, with the Otovent being recommended as an alternative. This is a relatively new operation (only available since 2011 in America, and FDA approval was only granted late in 2016). During the procedure, a balloon is passed through the nose and inserted into the Eustachian tube and then water is used to inflate the balloon to 10 bar for 2 minutes. 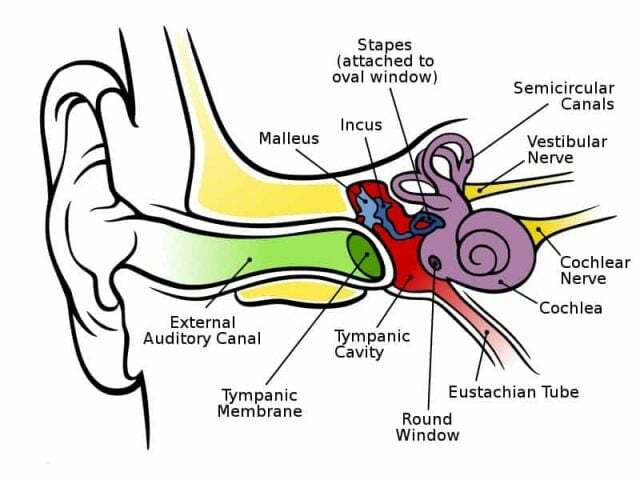 This stretches the Eustachian tube and can potentially cure Eustachian tube dysfunction. Often, a grommet operation will be performed before this surgery as a test to increase the likelihood of success with balloon dilation. The criteria for this operation and the pre-operation tests are far more stringent than for myringotomy, but one advantage is that patients don't need to avoid getting their ears wet afterwards. You can find out more about this operation here. See the following links for further information and practical demonstrations of the ear equalisation techniques described. "But What If It's Just Ear Wax?" The blocked sensation you get from ear wax can be very similar to the symptoms of a Eustachian tube dysfunction. With ETD, the hearing in one or both ears often "pops" in and out. This can be very similar to the sensation of intermittent hearing loss when ear wax moves around in the canal as it moves from a wide point to a narrow point of the canal and back again. If you think you have ear wax then why not book an appointment at one of our ear wax removal london clinics?